Eintracht Frankfurt coach Niko Kovac is certainly in credit in Europe's financial capital. The former Croatia boss has just celebrated two years in charge at the Commerzbank Arena, in which time he has turned Eintracht from relegation strugglers into European contenders by bringing nations together and shaping them into a formidable force in the Bundesliga. Eintracht were in dire straits when Kovac took over on 8 March 2016 - the club's 117th birthday. The Eagles found themselves in 16th – the relegation play-off position – when they dismissed Armin Veh and made the rather surprising decision to appoint Kovac to his first club job as a head coach, alongside his brother Robert as assistant. A respectable four wins from his first eight games in charge had Frankfurt sitting in the safety of 15th going into the final outing of the season, but a last-minute defeat at direct rivals Werder Bremen, who began the day in 16th, saw the sides swap places and Eintracht faced the drama of a relegation play-off against Nuremberg. A 1-1 draw in Frankfurt left the tie tantalisingly poised for the return leg just four days later, where Haris Seferovic netted the only goal of the game to secure the Eagles’ Bundesliga status. It was job done for Kovac, and having now nestled in, he was able to set about turning his flock around for the long flight ahead. That summer Kovac, along with sporting director Bruno Hübner, oversaw a deep clean of the Frankfurt squad. Fringe players were moved on, as well as the experienced Carlos Zambrano and Stefan Aigner. As it had with its coach, the club gambled on a number of inexperienced players from around the world. The likes of Jesus Vallejo from Real Madrid, Guillermo Varela from Manchester United, Michael Hector from Chelsea and Ante Rebic from Fiorentina all moved to Frankfurt on loan. With a squad he had assembled and trusted, Kovac was able to set to work. His first job was getting a group of players consisting of 17 different nationalities to work as one. When asked about his multinational squad at the start of the season, the Berlin-born son of Croatian immigrants dryly replied: "We're in Europe, it means nothing." When the question was raised of fans struggling to identify with such a diverse team, Kovac calmly responded: "This isn't Brexit or Fraxit, we're not concerned about politics – we play football. It's about performing. Those doing best will play, regardless of their age, looks or whether they’re German or not. "Our working language is German," he later added. "Everyone is obliged to learn German. We speak other languages so we can help people at the start, but there's also the language of football, and everyone speaks that on the pitch." Among the bedding in, Kovac's main objective was to turn around his side's fortunes. Quickly settling on a back four of Timmy Chandler, David Abraham, Vallejo and Bastian Oczipka, the Eagles began to soar in the early weeks of 2016/17 and sat fifth after five games. An early season highlight came on Matchday 7 as Eintracht held champions Bayern Munich to a 2-2 draw at the Commerzbank Arena. The result was much more than a timely feather in Kovac's cap as it was the game he stumbled upon a new formation that looked to suit his squad. Switching to a back-three with Chandler and Oczipka moving into wing-back roles, Eintracht embarked on a run that saw them collect 24 of a possible 36 points in their next 12 games, losing just twice. With natural centre-backs Abraham and Vallejo now separated at the back by playmaker Makoto Hasebe, Kovac's side reached a season high of third just after the campaign's halfway stage. The team that had only survived the previous season via the play-offs was now a fearsome defensive unit. Eintracht were not just grinding out wins, but turning their home into a fortress. Frankfurt remained unbeaten at the Commerzbank Arena in the first half of the season and boasted the second-best defence in the league after 19 games (just 15 conceded, with nine clean sheets). It's an improvement that can be traced directly back to Kovac himself. "You can achieve a lot with organisation, responsibility and discipline," the 46-year-old once told the Frankfurter Allgemeine Zeitung. Preaching such morals and being demanding in training are features of Kovac as a coach, but the figure seen on the touchline also bears striking resemblances to his time as a player. Lacing his boots for Hertha Berlin, Bayer Leverkusen, Hamburg and Bayern in the Bundesliga, as well as winning 83 caps for Croatia, Kovac was both a tenacious and strategic midfielder. Virtues he has now passed on to his Eintracht team. While the second half of the 2016/17 season did not quite reach the same heights as the first, Frankfurt still finished Kovac's first full campaign in charge in a respectable 11th place. The hope of a European place via the league had slipped away, but Eintracht's season did not end with their game against RB Leipzig on Matchday 34. 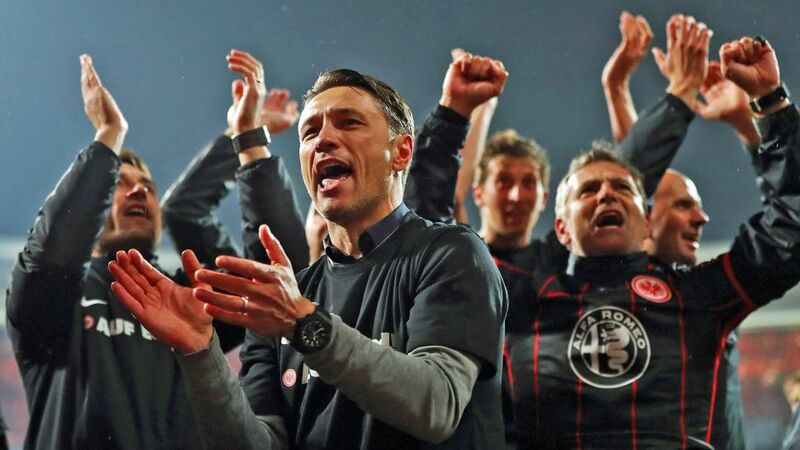 Kovac had guided his Eagles to a first DFB Cup final in a decade, but the title and subsequent UEFA Europa League place evaded Eintracht as they fell at the final hurdle in Berlin against Borussia Dortmund. Speaking to the DFB's official website after the defeat, Kovac reasserted his satisfaction at his team's efforts. "Of course we're disappointed, but my pride in the fact we pushed Dortmund all the way outweighs that." Asked about his summary of the season, he was full of positives: "This campaign was extraordinarily good. We ended it well with the final, and now we'll try to be even better again next season." And it appears to have been a rallying cry that his players have heard and fully understood. Kovac again had to lead a rebuilding project during the summer as a number of players, including the aforementioned loanees and first-choice left-back Oczipka, all left the club. Eintracht again brought in reinforcements, but learnt their lesson from the previous campaign and signed more players on permanent deals so they could create some continuity in the improving side. Jetro Willems joined as replacement for Schalke-bound Oczipka, while this season's top scorer Sebastien Haller, Simon Falette and full-back Danny da Costa all arrived for relatively small fees. Carlos Salcedo and Luka Jovic both joined on loan, while the invaluable experience of Kevin-Prince Boateng arrived on a free transfer. New faces and more new languages in the Frankfurt dressing room, but Kovac again looks to have gotten his United Nations of players pulling in the same direction and with the same relentless force. After 22 games last season, Eintracht were in sixth with 35 points to their name, but had just lost for a third game in a row as they began to slip down the table in the second half of the season. A lacklustre 3-0 loss at Augsburg on Matchday 21 threatened to spark bouts of deja-vu in Frankfurt. Kovac summed that result up as "just one of those days", but behind the scenes he set about putting it right. Eintracht bounced back with a resounding 4-2 win over Cologne, with the Billy Goats' goals only coming from the penalty spot and as a result of goalkeeper Lukas Hradecky's mistake. A 1-0 loss at VfB Stuttgart a couple of weeks later was again put right the next match with a victory over Hannover. It means all but one of Frankfurt's seven defeats this season have been followed by wins and sees them sitting in fifth, two points adrift of the UEFA Champions League places. The club are the only team alongside Bayern yet to lose from a winning position this season and have the second-best defence in the Bundesliga. Kovac's record of conceding just 1.2 goals per league game is a club record for anyone in charge for longer than a season. And Eintracht have also added another string to their bow this term with their improved away form, which is the fourth-best record of any team this season. The Eagles also find themselves in the semi-finals of the DFB Cup for a second consecutive year, making Kovac only the third coach in the club's history after Dietrich Weise and Friedhelm Funkel to achieve the feat. They will travel to Schalke in mid-April hoping to set up a final clash against Leverkusen or future employers Bayern. Eintracht are already better placed this season than they were at the same stage last year. Now it's about avoiding the slip-ups of last season and going one better in the league and possibly the cup. Kovac is the one driving that push forward, yet the coach seemingly remains the most grounded of the lot in Frankfurt. "Eintracht are not a world-class team, just an ordinary one," he said after the win over Cologne. "We have room for improvement. Not by talking, though, but by doing." Kovac's job now is to make sure no Eintracht heads get stuck in the clouds, and to push his side on to keep them ahead of their opponents in an incredibly tight European chase. And maybe add that first piece of managerial silverware to his collection as well - what would no doubt be the first of many as he prepares to take the reins of the record German champions. Click here for more Frankfurt news and features!